The glucose tolerance test checks the 2 hour glucose tolerance in the blood. The glucose tolerance test, or OGTT blood test, measures the body's glucose tolerance through blood testing. Why is an OGTT test important? An oral glucose tolerance test is used to diagnose diabetes and assess the body's response to ingested glucose. This Glucose Tolerance Test is a blood test. The glucose tolerance test, sometimes known as the oral glucose tolerance test, OGTT blood test or OGTT lab test, checks the glucose tolerance in the blood. The glucose tolerance test is a useful blood test in testing for diabetes risk and resistance to insulin in the body. The glucose tolerance test starts by having the blood glucose test level drawn. Then, the person will need to drink a glucose solution and, after two hours, another glucose test level is drawn to assess how quickly the body removes the glucose from the blood. In some cases, an insulin test level is also ordered to be measured during the test. Normally, the glucose levels will return to normal when the blood is drawn after two hours. Most clinicians feel that a normal glucose tolerance test means that the person does not have diabetes. To get a glucose tolerance test near you at a Quest Diagnostics lab, just order online and follow the instructions at the lab on the day of your testing. Once your OGTT lab results are ready, they can be downloaded. 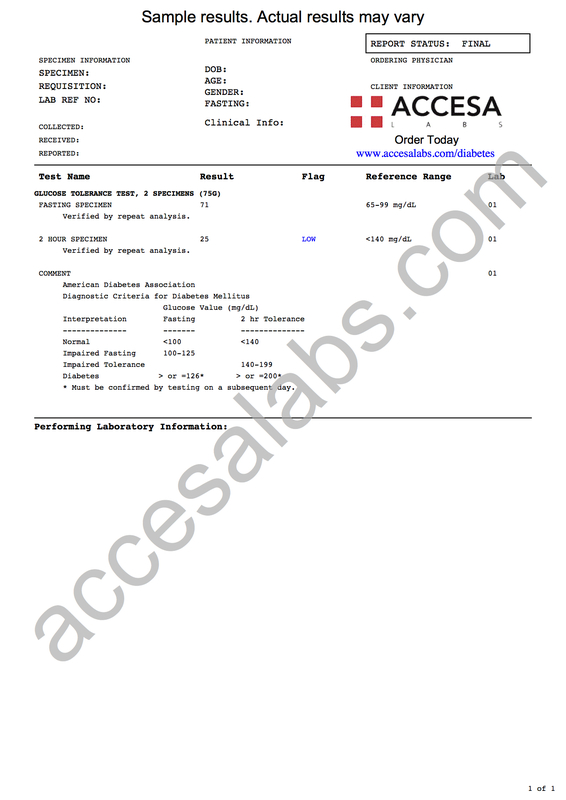 As can be seen on the sample glucose tolerance blood test results above, two lab results will be reported as numerical values and can be compared against the reference ranges provided by the lab. Based on where the glucose tolerance lab values fall, an interpretation of normal, impaired fasting, impaired tolerance, or diabetes can typically be made. The OGTT blood test is run over two hours. At the beginning of the OGTT test process, the patient drinks a glucose solution and the blood is drawn. Two hours later, another blood specimen is drawn. The glucose tolerance test results can be evaluated by assessing the difference between the readings on the two glucose results. Glucose Tolerance Test at Guaranteed Prices.